It's official! For the first time since 1978, Drum Corps International's World Championships will be held in Denver from Aug. 3 to Aug. 7, 2004, at the brand-new INVESCO Field at Mile High, home of the Denver Broncos football team. Denver officials are already excited about hosting championships. "We've hosted the Pope, the Summit of the Eight (a meeting of the eight leaders of the world's eight biggest nations), we've won two Super Bowls and two Stanley Cups, but for sheer pulsing excitement, it's hard to top the thrill of having 50 drum and bugle corps all in one spot," said Richard Grant, director of communications of the Denver Metro Convention and Visitors' Bureau. Mark Arnold, director of Denver's Blue Knights drum corps, said, "Our fans are really going to love coming to Denver. It's one of the top summertime destinations. It's going to be great having this world-class event in such a wonderful world-class venue as INVESCO Field at Mile High." The Denver setting will bring back a flurry of memories for Dave Gibbs, director of the Blue Devils. Gibbs performed with the Blue Devils at World Championships in Denver in 1977 (as a soprano player) and in 1978 (as drum major). 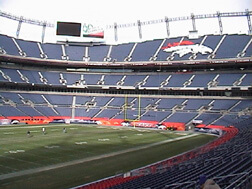 Back then, the event was held at a venue named Mile High Stadium, which was replaced by INVESCO Field at Mile High. "It's a great city to have World Championships in! It was fun when I performed there in the late '70s -- I have great memories, and I look forward to bringing the Blue Devils back to the wonderful surroundings of Denver," Gibbs said. Stay tuned to DCI.org for updates.